The Bosch GST 90BE Jigsaw has top-class convenience in the entry level class and is the reliable partner for day-to-day use. Offers a high level of convenience with Bosch SDS for easy, tool-free saw blade changes. It has a powerful 650 Watt motor for fast work progress. The improved saw blade clamping system for high cutting precision. It has a bend-resistant steel sole plate, offering exemplary running smoothness when sawing, which ensures best results and low-fatigue working. The 4-stage pendulum action provides tear-free cuts and control electronics for material-specific working. The dust blowing function enables a clear view, and can be switched off for effective dust extraction. 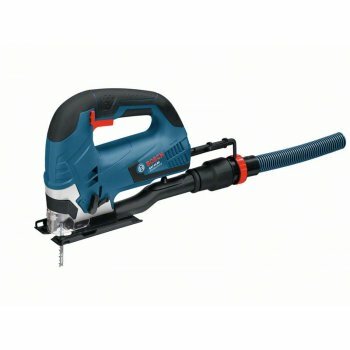 Specification Input Power: 650 Watt.No Load Speed: 500-3,100/min.Stroke Length: 26mm.Cutting Depth: Wood: 90mm, Aluminium: 20mm, Non-Alloyed Steel: 10mm.Cable Length: 2.5m.Weight: 2.6kg.